Let the journey begin :). Who will be learning it? Thanks for the course! Enjoying it so far. I will. It says it's released in the incubator but it won't allow people to switch to the course. Anyone got in? It says it has 32 learners? I have just managed to get into the forum... but no actual course yet! 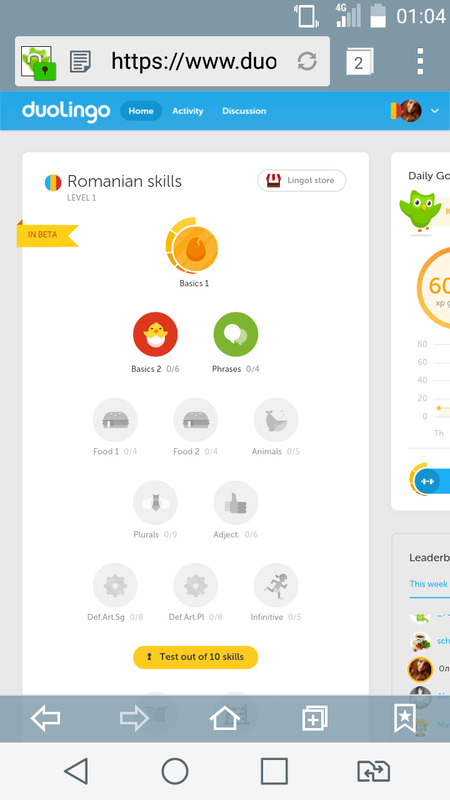 Go to Settings->Learning language then click Romanian! Are you guys half Romanian or fully Romanian? I'm half from my Dad. Yes, the actual lessons are good, but the audio is awful. Beta doesn't excuse that. We know some of the words, mainly "beau" is pronounced wrong... We're working to disable audio for those sentences until we find a different solution. It seems to be a drinking thing :-)))... later in the course "beam" (I drank), was supposed to be pronounced as (bey-ahm) but it is also pronounced wrong. Romanian is the only major Romance language I haven't studied so far, and I'm so happy it's here! I'm excited, looks fun. besides Spanish it's the main Roman language I wanted to learn so I'm pretty happy. What do you mean main? Great! I've doing some lessons (five or six skills). By the way, I cannot type the special letters. How are you all typing them? I am so excited to start learning this awesome language! I'm here for it! I'm very excited. I lived in Romania for a few months and studied a bit while I was there, but it's so hard to find resources online to continue to study. Thanks to everyone who worked on the course! Lots of errors and why would Ana eat a canary?! ?